Web site of Internationally known photographer Gordon Warren and his wife Kathy. Gordon's photos of Cape Breton are highly regarded and can be found in various publications about the island from provincial web sites to books. We are very grateful for his gracious permission to use a collection of his island photographs. One of the most comprehensive web sites on the internet for information about Cape Breton. Professionally constructed - easy navigation - there are plenty of photos as well as downloadable PDF files on many topics. We thank them for allowing us to use the map of Cape Breton they created for their site - it is a particularly good one. To search ALL of Cape Breton, one needs to select both the "Highland Region" and "Cape Breton Region". This link will take you to an MLS® page where you can specify the details of your search for property on the entire island. 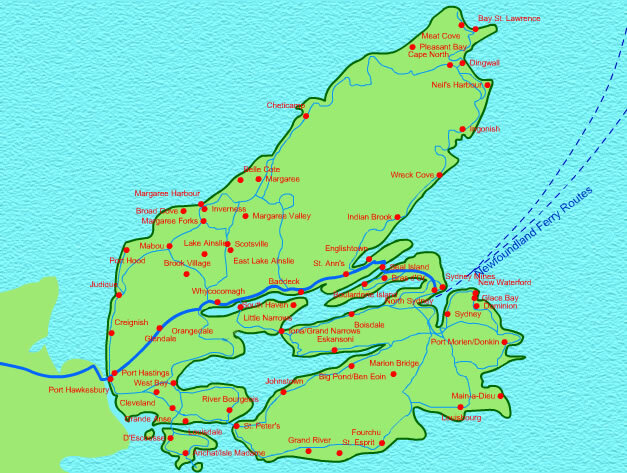 The Highland Region includes some territory of mainland Nova Scotia as well as a large portion of Cape Breton Island.  ICELAND ON THE WEB - Another beautiful island you may wish to visit and if you do, this web site provides a good overall guide to the country.  NATURE EXPLORER - Also a site with information about how to explore Iceland, but just its great outdoors. Specifically, the site covers: Adventure/DayTours, Private and Longer Tours, Hiking, Mountain Biking, Birdwatching and Photography. This site was created and is maintained by local artist Cécile Samson. There is a lot of unique Cape Breton information on this site in addition to her paintings which can be ordered on line... also tons of photos by local photographers and one of the best Cape Breton link pages available. Hosted on St. Peters Cable - just click "Enter Cape Breton Living". Pat and Angela, a dynamic duo recently transplanted from Toronto ( and delighted to be so ) are now taking reservations for the season as owners/operators of their own B&B especially for motorcyclists. It's a beautiful location on the Cabot Trail in Middle River.... 3 bedrooms, a cafe, garage with vehicle washing and maintenance facilities and 100 acres of woodland trails to explore. Background information on CBI, good enlargeable map. Cape Breton's famous trail (road) that circumnavigates the northern peninsula of Cape Breton. A good and useful link for the attractions, locations and availabilities of B&Bs, activities, scenic reviews of Cabot Trail, memorable locations and some restaurants. It includes site specific details on the Snow Crab fishing industry, as well as where one might go to eat them. A regional smaller site that gives local information about community doings, celebrations and activities amongst the smaller communities in Central Cape Breton, including the Orangedale area, Little Narrows, Grand Narrows, Iona and in between. Links to job opportunities and Lottery results, and a few government sites broaden this site considerably. A very comprehensive site. Has good links pages and a very nice photo gallery. The latter includes 3 photos of Inverness Beach - an outstanding island beach due to its length, depth and the amount of shallow water for swimming out from the shore. For area news - this is the web site of a local weekly newspaper. Englishtown's claim to fame - all about the college and community. Weather map of Nova Scotia where you can click on Cape Breton's major towns to see what the weather conditions are in those locations. A good source to check if you are planning a visit to the island. The site is set up to let you look for possibilities by general location. A good review of Cape Breton's four outstanding golf courses, with ratings that suggest some of the best in Canada. The county web site - has links and information to towns such as St. Peters. 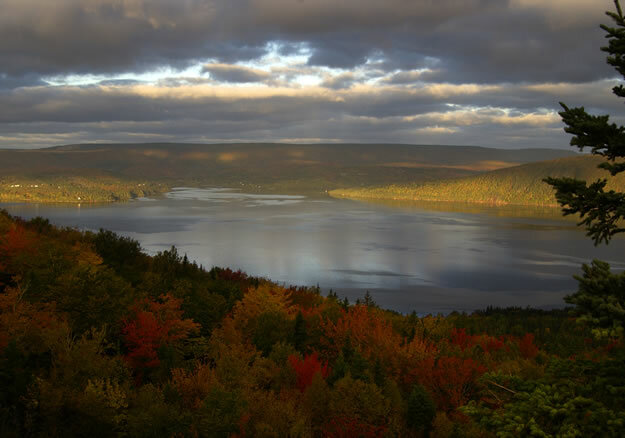 Wild and unspoiled, the western side of Cape Breton Island, in Canada’s Nova Scotia, draws thousands of visitors every summer....Cabot Trail, park tours, and driving tours. Gateway to the Bras D'Or, The Village on the Canal - all about the town, including history, attractions, geography, tourism and a photo gallery. Residents of Florida like to come to Cape Breton to escape the heat in August and September. Likewise, many Cape Bretoners and Canadians in general, like to escape the cold here in January, February and March. If you are one of the latter and interested in acquiring real estate in Naples, Florida, I highly recommend you contact this Realtor/Architect through his web site. I've known him for years and I am sure he will take very good care of you. He's painfully honest and very knowledgable. St. Ann's Bay (W. Gordon) Click for better look. Click to see a detailed map of Cape Breton. © 2005-2010 CapeBretonEstates.com. All Rights Reserved.